In another few days’ time, the year is coming to an end. 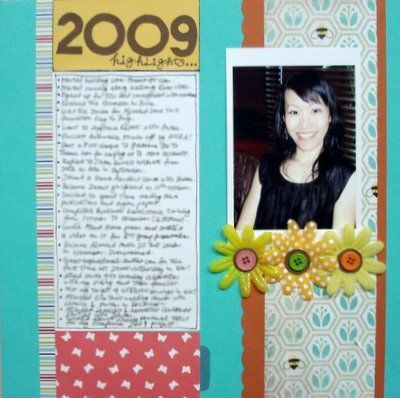 This scrapbooking idea is to let you do a review, recap of the year. On my layout, I called it “2009 Highlights”, it works like a year review. I simply listed out in bullet-points, the events that stood out in the whole year for me. What are your favorite memories for the last 12 months? Did you get promoted at your job? Did a relative or dear friend give birth? Was your best friend posted overseas for a work assignment? Did you achieve some targets that made you feel proud of yourself? List them all down. Years later, when you look at this layout, in a quick glance you’ll be able to remember the major events that occurred in that year. For me, I’ve listed 22 items. Some are about goals set and achieved. Many are about activities I’ve participated in or events I’ve attended over the months. Two are things I’ve done to show appreciation to those who’ve helped me along the way. It’s been an exciting and good year for me. Things that I’ve never anticipated unfolded in a lovely way for me. I’m humbled and thankful when I recalled some of the nice things that happened. All these set me feeling bright and hopeful for 2010 where I’m looking forward to even more beautiful stuff unfolding. 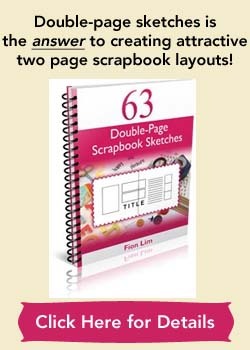 And thank you, for joining me in this journey of creating scrapbook pages that’s about YOU! 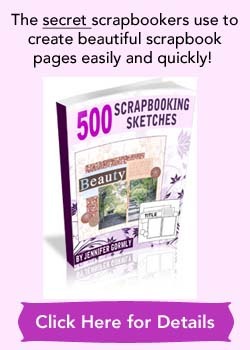 Scrapbooking ideas that pull you out of the ritual of scrapbooking about others and into topics that really matter to your heart. I hope you’ve enjoyed the process and learned something along the way! As always, happy scrapping! Supplies used: Cardstocks – American Crafts, Bazzill Basics; Patterned papers – American Crafts “Backyard Peep”, Basic Grey “Urban Prairie – Wild Flowers”, Three Bugs in a Rug “Paisley Flowers”; Silk flowers – Doodlebug “Bumblebee Silk Flowers”; Buttons – from stash; Black pens – Uni Pin Fine Line, Zig Memory System “Millennium”; Brown ink – StazOn “Timber Brown”; Alphabet stencil – from stash.